Four months after Nixon signed his law on December 28, 1973, a small songbird lifted off from the Bahamian island of Eleuthera on her way to breeding grounds in Michigan. With a gray back and pale yellow throat, breast and belly, her plumage was lighter and more subtle than that of the male who would become her mate. Still, she was beautiful. She would not be making a marathon journey such as that of some of her distant relatives like the blackpoll warbler, which migrates non-stop over the Atlantic Ocean an incredible 2200 miles in fall. But her trip was not without considerable risk. Weather and other challenges faced her as she made her 1500-mile voyage. The little bird arrived on the jack pine barrens in our northern lower peninsula in May, a week or so after the males had returned. As with most songbirds, the males reach nesting grounds first, each carving out his territory quickly. And as with most creatures of all kinds, it is the female who ultimately makes the choice of mates. In relatively short order after her arrival, our bird chose her mate, a male with the finest habitat in which to raise her young. She picked the spot for her nest in the ten acres her mate was protecting, in this case placing it close to the edge of his territory. He moved the boundaries in order to reduce the amount of land he needed to defend from predators and other males of his species. As the female built her nest of leaves and grass, her mate began bringing her food. After she lined the nest with moss and deer hair, she laid six speckled, cream-colored eggs in it. Two weeks after she laid the last egg, her chicks hatched. Ten days later, they fledged. From the time the chicks hatched until four weeks after fledging, both parents fed their young. This was a Kirtland’s Warbler, and she carried out her nesting cycle in jack pine barrens on a sandy outwash plain that has been duplicated by virtually all in her family from the glaciers’ retreat more than 10,000 years ago. By the time President Nixon signed his Endangered Species Act, this warbler was already in trouble. Although always a rare bird, the population had declined in 1971 to only 200 males. By the time my husband and I first saw it sixteen years later, the bird’s numbers had sunk to 187 males. Our guide said it was almost certainly headed for the black hole of extinction. That was an unthinkable possibility for a bird lover who had just adopted Michigan as her home state. The species was initially described in 1851, but the first Kirtland’s Warbler nest wasn’t discovered until 1903 in Oscoda County. For more than ninety years, all subsequently discovered nests were within sixty miles of that site. Since then, a small number of nestings have occurred in Wisconsin and southern Ontario. With the help of Nixon’s groundbreaking law, Kirtland’s Warblers were brought back from the brink. Today, more than 2000 males attest to a population increase of more than ten times since its nadir in 1987. 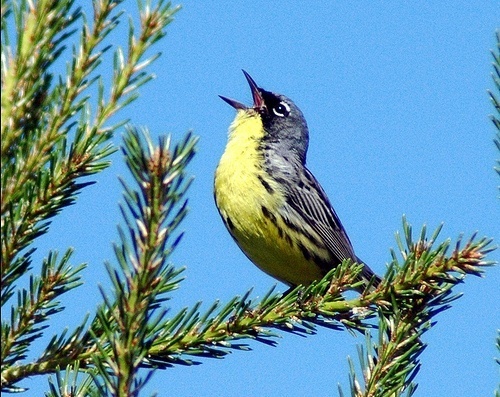 In spite of the handful of nests outside our state, Kirtland’s Warbler has always been, and will remain, Michigan’s bird. As we approach the 40th anniversary of the Endangered Species Act, we in Michigan have an extra reason to celebrate: the current healthy population of our own very special bird. Kay Charter is executive director of Saving Birds Thru Habitat, an organization that teaches people how to help migrating birds whose populations are declining. Please click here for a complete calendar of events. Kay also serves on the Kirtland’s Warbler Alliance.